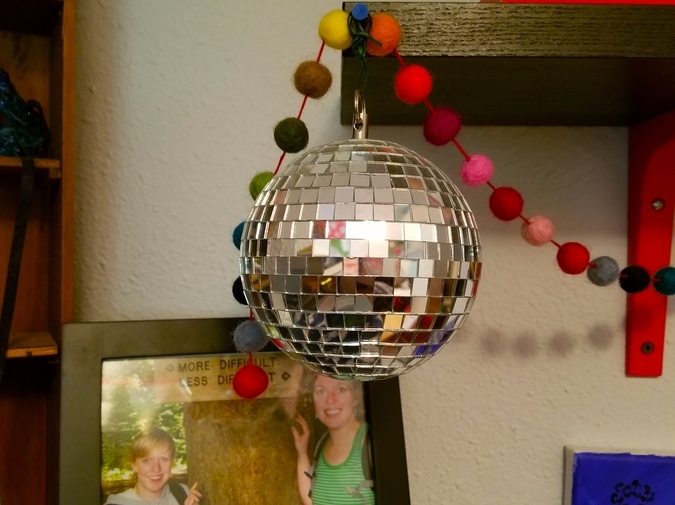 My mirror ball is hanging from a shelf above my dresser. I don’t remember where I got it. I know I didn’t pay for it. I think maybe my sister Zoe gave it to me. Maybe it was in a bunch of her belongings that she was getting rid of when she moved. She moves a lot. From Boston, to New Orleans, to Seattle. I don’t know where her stuff is, maybe in storage, maybe in New Orleans in one half of the duplex she still owns. I have a hard time keeping track of where Zoe is, what her plans are, my brother in law’s deployments out at sea with the Coast Guard. It’s a small mirror ball, a little disco ball, the size of a grapefruit. But with all the segmented mirrors on its surface, it also looks like the Death Star. When I think about the Death Star, it seems really stupid. Like, George Lucas, couldn’t you have come up with a better name, something not so obvious? And it doesn’t even look like a star, it looks like a big ball. But I guess the Imperial forces didn’t care about marketing their Death Star. They weren’t in some kind of legislative battle about how to sell the idea of the Death Star to their constituents. They called it what it was. It was a Star, but for Death, you know? Pretty straightforward. It’s fucked up, but every time I hear about a mass shooting, I think about how Zoe’s day is going. Zoe works with a nonprofit that tries to enact sensible gun laws, that tries to protect people from gun violence. Every time there’s a mass shooting I think of her, pulled over to the side of the road, calling other nonprofits, making a plan. Her whole day derailed. Her plans for dinner scuttled. “Zoe’s going to be late,” we say at home around the dinner table. “Zoe’s had a bad day,” we say after hanging up the phone. Zoe’s nonprofit has a billboard in Boston that shows the number of people killed from gun violence in the United States since the Sandy Hook Massacre. When people die by gun violence, it’s someone’s job to change those numbers. Like, it’s someone’s literal job to put a new higher number on the billboard. Today the number is 166,282. 166,282 Americans killed since Sandy Hook. I wonder, who does that job? Are they freelance? Are they sad when they hang the numbers, or does it seem normal to them? It’s also someone’s job to tweet about the mass shootings. It’s someone’s job to talk to elected officials. It’s someone’s job to conference with other nonprofits. It’s someone’s job to fundraise for non-profits that are fighting against gun violence. It’s someone’s job to talk to mothers and fathers whose children have been murdered. It’s emotional labor. It’s labor. It’s work. There is also an industry of fear and it sells guns. These people, who work for the NRA, they also have regular jobs. They have stupid, everyday, ordinary, pedestrian, humdrum, common, conventional, menial, routine, repetitive, commonplace, no big deal, normal jobs. You know, just like there are janitors on the Death Star.